The Town of Century has official unveiled a new website. 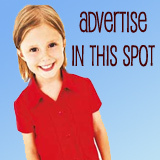 The site was built and is hosted by Municode, a Tallahassee based firm. Century currently contracts with the company to make their code of ordinances available online..
Municode submitted a base bid of $4,000 for design, development and implementation of a new website and $1,500 for annual hosting, maintenance and customer support. An interest-free four year payment plan was offered. Municode has been in business for 66 years and works with over 4,200 government agencies across the country. 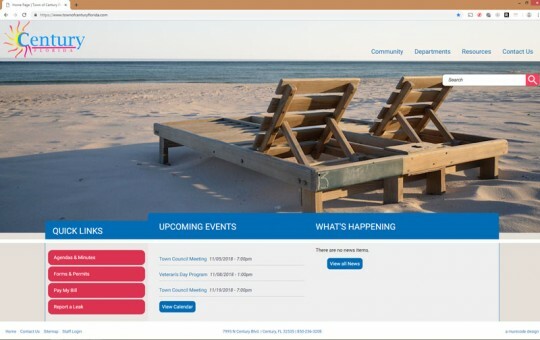 Townofcenturyflorida.com was to be constructed using content management system (CMS) that will allow town employees to keep the site updated. The town’s previous website was last updated in 2015. That website was developed by an area marketing firm in 2012 for $5,950, part of a $11,450 package that also included a five year comprehensive marketing strategy. that site is funny and sad. i tell people i live in south flomaton. that picture would fit the right time period. You would at least think any picture of the old Alger train, showalter park, an archived pic of the sawmill, or even the new city hall would have been better. Something that represents what the town is (or was). BTW, You guys know WordPress is free. And godaddy is pretty cheap for the light traffic you’ll have. I bet there is enough talent in local schools and willing citizens to design and host for free. I forgot to suggest the many beautiful sunsets at Lake Stone Campground as another photo option. I know someone who has a collection of beautiful photos that would probably, proudly offer one to promote Century. Would have made more sense to show a beautiful cotton field or peanut field or a old time tractor plowing a garden, things that are relate-able to this area. Even train cars would have made more sense than a beach that is 52 miles away! I have designed websites as a hobby “for free” and feel like I have done a better job than this one for $4000. I was actually excited to see it and when I opened up the link, I’m sorry, but I had to laugh. I was really disappointed, but seems to be a common theme in Century these days. Reading all the comments posted here, I’d say website critiquing is required! Not going to lie…. but Century, FL. You get what you paid for. BTW – When did you all get a beach? It isn’t even a local beach, the sand is the wrong color. Shouldn’t they be rearranging those chairs…. I enjoyed the first paragraph and the last sentence. Notice there’s still no access to public records. Mayor keeps on keeping on keeping the public from knowing how bad it is. BTW James, you said it! “rather than criticizing Century” How can anybody take Century seriously, when their new website shows a beach that doesn’t exist, representing a town that cannot keep businesses even when they subsidize and pay the mortgage? Why didn’t the website feature a cover shot of the ever popular sawblade and maybe some boarded up trap houses? I agree with Grand Locust!!! 1) The new website can alert employees when their paycheck is going to bounce. 2) Display information regarding the terms of all installment loans. 3) Show the monthly payments/balances of those installment loans. 4) Show current account balances for revenues/expenses. 5) Notify taxpayers when new trucks are purchased (and the price). 6) Allow the Mayor to mandate the actions/words of the city council. 7) Notify Century of freezing weather during the winter months. Notify Century of last minute “emergency meetings”. 10) Assume that when the website goes down so did Century? James you win Post Of The Day Award. No palm trees swaying in the breeze or beach umbrellas? The website is a great improvement over the prior web. Clean lines and easy access information portals. The price was reasonable and it appears to me that rather than criticizing Century they should be commended for improving information disbursement to citizens and saving taxpayer dollars. That’s not even a local beach. It’s a stolen photo from another country. Century has been on life support for at least 25 years to my knowledge; just pull the plug, dissolve the city government and let if fall back to Escambia County. Century will never amount to nothing except a breeding ground for corruption. So, a RonJon surf shop is coming, right? We use to go to a beach in Century when I was a kid! I forget the name of it, but something “beach”. Think it was merely a gravel lake though now that I’m grown and looking back. Does the website have a loan application? You hit it right on the head James! Well, Mary and BT already got the good line. What’s the URL of this website? The website picture depicting the sandy beach and lounge chairs accurately reflects Century’s state of current affairs – misleading and irresponsible.